There's a feature every month in Every Day with Rachael Ray (magazine) where Rachael has a picture of celebrity with his or her open fridge. Rachael asks the person questions about the contents of their fridge and the answers are supposed to tell you more about the person. I have no idea what the contents of my fridge say about me, but I figured I'd give this a try. 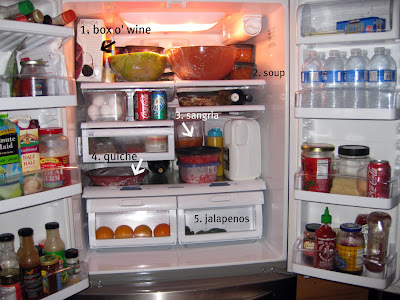 I chose five items that aren't normally in my fridge and explained them. I also numbered the picture (hope you can see it). This picture was taken this past Sunday evening, normally the peak day for the fridge. 1. box o' wine - So, we don't normally drink our wine from a box. This is nothing against boxed wine drinkers, but my husband likes reds and I like whites, so we normally just open our own smaller bottles. Boxes tend to have at least two if not four bottles worth of alcohol and although they are supposed to have a long shelf life, we just don't deal with them. This is a box of Merlot that was brought to our home for a recent barbecue (we appreciate it). I think it's weird to store red wine in the fridge, but that's what the box told us to do. My husband enjoyed a glass, I used some in the minestrone soup (see #2) and I'm planning to use some of it to make sangria this weekend. 2. soup - I made a large pot (5 quarts) of minestrone soup with a modified version of a recipe from Tyler's Ultimate (http://www.foodnetwork.com/recipes/tyler-florence/hunters-minestrone-recipe/index.html). Normally I portion the soup into quart-sized containers and share some with mom, eat some for lunch the next day, and freeze the rest. 3. sangria - Mom made me a batch of white sangria. Yum! 4. quiche - I had a bunch of random stuff in the fridge on Saturday and I figured we needed to eat breakfast/brunch, so I made a breakfast quiche. I had an open package of bacon, some cheddar, and too many eggs and a refrigerated pie crust. Quiche! 5. jalapenos - Does anybody need them? I planted one jalapeno plant in my garden this summer and it's producing like crazy. I can only eat so many and my hubby doesn't really like them! I pick them every day and they are starting to pile up. We also have jalapenos out the wazoo! Doug wanted to get just one or two plants, but the store was only selling them in packs of nine (odd number, go figure). We have so many jalapenos, we can't use them all. Doug has been taking some to work with him.